The CoffeeShop Blog: CoffeeShop Web Round-It Photoshop/PSE Action! CoffeeShop Web Round-It Photoshop/PSE Action! I have a few rounding corners actions, but this newest version is the one I use all of the time. This one-stop action flattens, rounds the corners, resizes for the web, and sharpens your image so it is ready for posting! To use this action, simply push play. The action will prompt you to adjust the corner smoothing (higher numbers for high resolution images), input your final web-posting size (adjust the top pixel width only), and then allows you to sharpen the image (adjust just the radius). Run it again if you want an oval/round image. Save as a png if you are posting on a colored background and as a jpg if you are posting on a white background. Have fun rounding your corners! 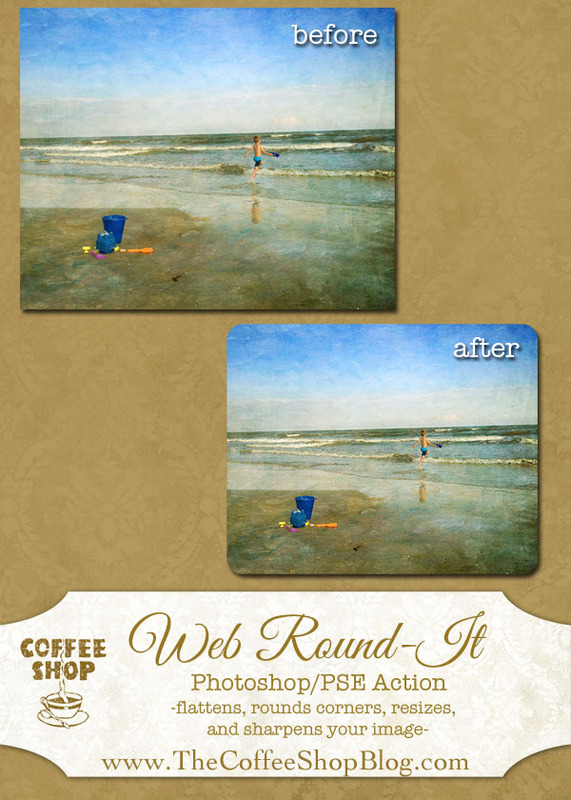 Download the free CoffeeShop Web Round-It action for Photoshop/PSE. You can also download it here. Love that you're sharing this. I wanted to round corners just the other day, and this way won't have to manually each time. Thanks a bunch and Happy Sunday. I tried loading it into my PSE 11 and it said that it is not compatible with this version of Elements. All of the ones I have loaded in the past have loaded just fine. Are you going to be making one that is compatible with PSE 11? I tested this in PSE11 and it worked. :-). Make sure you are loading the proper files!